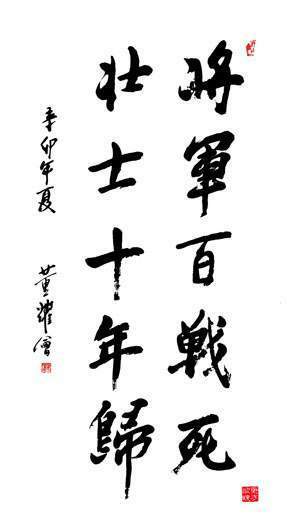 If it was us who would create the Chinese character to mean Hundred, what could be a logical choice of that? Recall that Oracle Script and Bronze Script of Ten was created from an original meaning as "Standing up". What will be the next milestone of a human being in her life? Capability of speaking! If you were a parent of a toddler at her age of 18 months around, you would know she just keeps speaking something with you which you even do not understand. So you are right, Chinese ancestors used "Just learnt speaking - talking rapidly and continuously in a excited, or incomprehensible way." which is "百" to mean Hundred。 It sounds insane at the first glance, but now I guess you will appreciate it. Oracle Script , lower part is consisted of and , which are two overlapped tongues , Chinese ancestors used this "two overlapped tongues" ( ) to mean "talks without proper pronunciation", upper part is to mean "the same". thus the overall means "Keep talking without proper pronunciation and would not stop". This is its original meaning. Bronze Script and Seal Script are the continuation of Oracle Script . Clerical Script is further simplified to be very similar as the way we write now - "百". As "百" contains the meaning of "talks a lot", it can be used to mean "a lot", instead of actual 100. "百" can also mean "Keeps talking without stop", which usage can only be found in ancient documents. Some examples of numbers which are greater than 100. Again, we will learn Thousand as our next Chinese character, if it was you who would create it, how will you present its meaning?